Sadly, there’s a damn good chance MJ misses this. Gamers have been trained to expect annual installments of sports franchises. While developers try to add or tweak enough features to improve the overall experience, for most the main draws are the continued ability for online play and updated rosters. 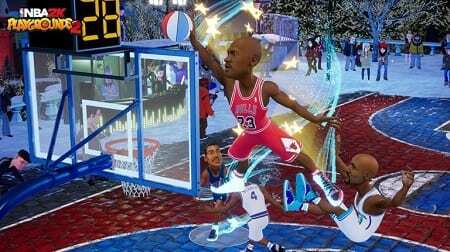 Into that world steps NBA 2K Playgrounds 2, the now 2K-branded follow up to 2017’s delisted NBA Playgrounds, and after playing it we’re left wondering… why the original even needed a sequel? Not a lot has changed since the original, though those that moved on early enough will find the shot meter, which was added in a post-launch patch, to be new. It’s certainly better than the cryptic “under the hood” system that was in place, but the meter is too black or white. Land in the correct zone and you have a chance to make the shot (based on your player’s skill); stop the meter anywhere else and it’s a guaranteed miss. We would’ve preferred something more gradual. What hurts NBA Playgrounds 2 is that the shot percentages often seem nonsensical. Our first run through the game’s Season Mode had us guiding the Suns with Steve Nash and Cedric Ceballos, an excellent three-point shooter and former Slam Dunk champion, respectively. And yet Nash’s success rate on the meter never topped 35 percent, and Ceballos was good for several missed dunks per game. That flies in the face of the game’s ratings along with any kind of logic (or fun). It’s hard to express how frustrated we became as the misses piled up. We had to hold our breath on breakaway dunks, and even resorted to taking short jumpers because those had inexplicably higher make percentages. Suffice to say that when you’ve made people choose shooting bunnies over insane dunks and alley-oops because they miss too often you’ve missed the mark as a fast-paced arcade game. On the bright side, there have been noticeable strides made with defense and rebounding, making it at least possible to shut down your opponents with good positioning, aggressiveness on the ball and well-timed rebound attempts — the one caveat is that put-back jams are way too common, to the point that we’d expect a patch at some point. Tossing the ball off the backboard for a dunk is also a fun addition. Playgrounds 2 tries to keep things lively with its Lottery Pick system, which is just a renamed version of the power-ups seen in the first game. There are a few more, and they seem to trigger more often this time, but some are poorly explained, and we could never shake the feeling that the CPU team pulled far better ones than we did. If any improvements were made visually we couldn’t tell. It’s entirely serviceable, and it animates smoothly, but the quality varies considerably from player to player, some of whom you’d be hard pressed to identify if their names weren’t there. The audio has a little more variety as you can select one of several YouTubers to pair with Ian Eagle, but it’s sort of pick your poison as none of them add much to the game. Easily the most significant changes in NBA 2K Playgrounds 2 occur in how players and gear are unlocked, and how the single-player portion is structured. Gone are tournament ladders, replaced with a 15-game season where you guide a single team through its conference and maybe on to a championship. There are multiple difficulty settings, and a full campaign can be completed in a couple of hours, making it an upgrade from its predecessor. Unlocking players has taken a step back, however, crimping heavily from our least favourite part of NBA 2k19, micro transactions. At a cost of US$29.99, Playgrounds 2 locks almost all of its available players away, giving you precious few options to select… unless you wanna pony up an extra 10 spot, which unlocks everyone. Of course, it isn’t mandatory, as you can earn in-game currency to purchase packs of cards to unlock them, but the costs are substantial, and the process is painstaking. A second currency is used for cosmetic items — shoes, shorts, etc. — and is even harder to come by with paltry amounts arriving in the five-card packs. While we’re no fans of the NBA 2k19 method, there you’re ultimately talking about accelerating your player’s development, making him a star right now rather than grinding it out over seasons of taking the court. This is much worse. The game is withholding actual players, and everything feels like it’s there to encourage you just to purchase the unlock so you can use the players you actually want to. Now, if you’re sitting there thinking you’re cool with unlocking it all gradually, keep in mind that the game has a robust roster filled with stiffs and pseudo legends, and you’re sure to unlock the Thon Makers and Tim Fraziers of the world long before you get LeBron James or Kevin Durant. And that brings us to the rosters themselves. Who signed off on these? Players that moved teams last year aren’t updated — Gordon Hayward is on the Jazz, Victor Oladipo is on the Thunder, and countless more — and the game’s definition of legends for teams is downright comical: Dave Cowens played 40 games with Milwaukee, Adrian Dantley played 10, but they’re Bucks legends while Sidney Moncrief (700-plus games) is with the Hawks. The 400-plus total is also padded out with dozens of scrubs, often with the wrong team. It’s a terrible job. There are fun moments scattered about NBA 2K Playgrounds 2, such as the three-point shooting contest, but those are undone in a torrent of missed slams, cheap feeling Lottery Picks and the constant feeling that better players (and, by extension, a more enjoyable experience) are just 10 bucks away. Our least-favourite part of last year’s installment was the aimless, unskippable story attached to MyCareer. Things have improved markedly on that front in NBA 2k19 as you step into the shoes of A.I., beginning with him waiting on draft night and never getting the call. From there you end up in China, progress to the G League and so on. It’s unfortunate that the game modes underwhelm because the actual representation of basketball has never been better. Players handle differently, size and momentum affect body contact animations, and defenses and offenses play more realistically. It’s exceptionally well done. As with most sports games, NBA 2k17 contains an individual-based mode (MyCareer) and a team management sim (MyGM) as its two primary options. Starting with the former, it continues with the series’ unique approach by creating a narrative aspect and pairing it with the sports. Unfortunately, it works better in concept than execution. This season, Thompson started perfect at the line in October, got more touches in November and then started really shooting the lights out from downtown as 2015 drew to a close. The first half of this season put him on a trajectory to set a new career high in treys. Yup, studly.